Corona's 2018 October Market Update is Here! Check out Corona’s 2MMU! Currently Corona, Ca has 295 New Listings. The highest sold was an astonishing price of $2,575,000 at 2425 Garreston Av. 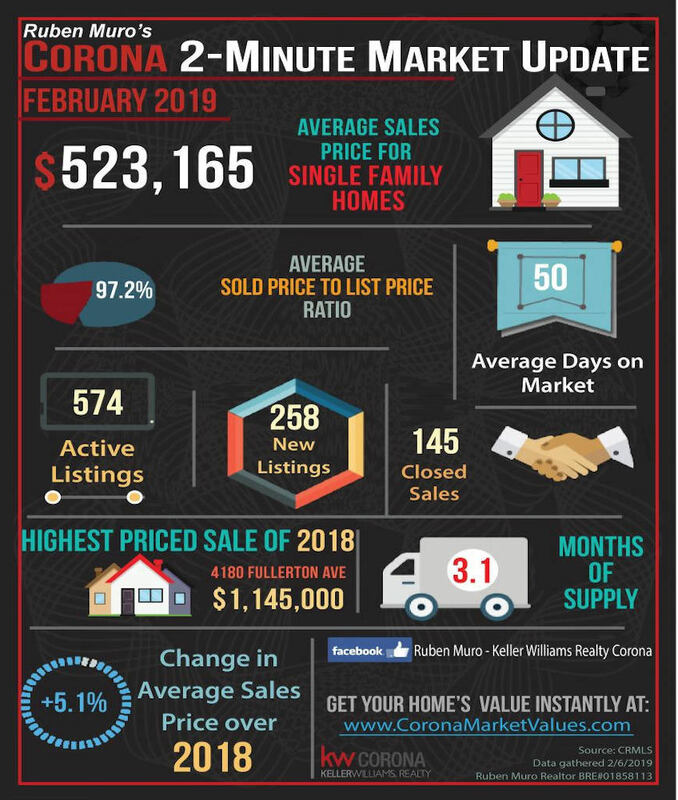 To See More Real Estate Statistics for Corona and each of the Corona Zip Codes, Scroll Down. They are in an easy to read format and include 92879, 92880, 92881, 92882, and 92883 Zip Codes. Check them out! Here are 92879 Zip Code area real estate market statistics for October, 2018. The average sales price for homes in 92879 Zip Code was $422,828, on average homes sold for 98.4% of their list price. The average days on market were 43 days. There were 98 active listings with 50 new listings and 40 homes sold. The highest priced sale in the 92879 Zip Code area so far is 768 Morita Drive, Which sold for $750,000. Inventory is at 2.7 months. There is a 4.9% increase in average sales price over this same time in 2017. Here are 92880 Zip Code area real estate market statistics for October, 2018. The average sales price for homes in 92880 Zip Code area was $568,390, on average homes sold for 98.2% of their list price. The average days on market were 37 days. There were 209 active listings with 105 new listings and 61 homes sold. The highest priced sale in 92880 Zip Code area so far is 13149 Berts Way, which sold for $888,000. Inventory is at 3.7 months. There is a 9.3% Increase in average sales price over this same time in 2017. Here are 92881 Zip Code area real estate market statistics for October, 2018. The average sales price for homes in 92881 Zip Code area was $562,041, on average homes sold for 96.2% of their list price. The average days on market were 52 days. There were 137 active listings with 48 new listings and 41 homes sold. The highest priced sale in 92881 Zip Code area so far is 2425 Garreston Av, which sold for $2,575,000. Inventory is at 4.3 months. There is a 6.7% increase in average sales price over this same time in 2017. 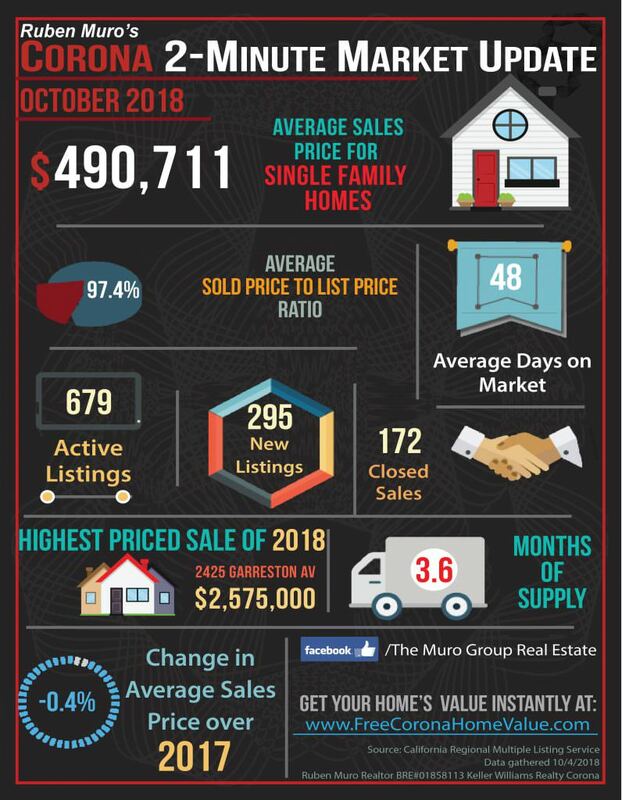 Here are 92882 Zip Code area real estate market statistics for October, 2018. The average sale price for homes in 92882 Zip Code area was $461,767, on average homes sold for 97.6% of their list price. The average days on market were 40 days. There were 176 active listings with 86 new listings and 39 homes sold. The highest priced sale in 92882 Zip Code area so far is 3821 S Main St, which sold for $1,388,000. Inventory is at 3.1 months. There is a 11.2% decrease in average sales price over this same time in 2017. Here are 92883 Zip Code area real estate market statistics for October, 2018. The average sales price for homes in 92883 Zip Code area was $509,343, on average homes sold for 96.8% of their list price. The average days on market were 58 days. There were 220 active listings with 90 new listings and 37 homes sold. The highest priced sale in 92883 Zip Code area so far is 9376 Gum Tree, which sold for $1,198,000. Inventory is at 4.3 months. There is a 0.6% decrease in average sales price over this same time in 2017.